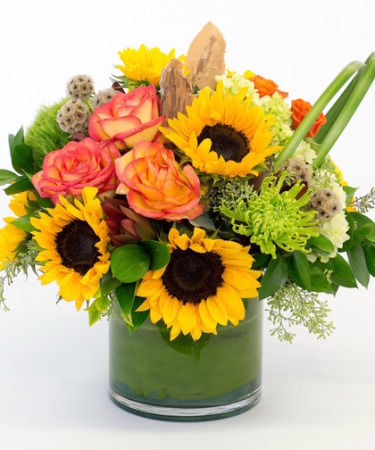 Majestic roses, sunflowers, hydrangea and scabiosa are accented with bark and luxury green and arranges in a leaf lined vase. 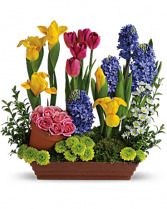 Approximately 10" x 10"
Roses and tulips and hyacinth - oh, my! All your spring favorites are here, whimsically arranged in a current tin container in pretty pastel spring colors. 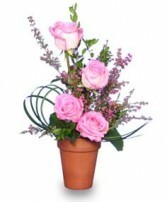 The fun potted flower arrangement is a wonderful way to welcome a new baby, cheer up someone you love or brighten your own entryway. Also, a great housewarming gift! 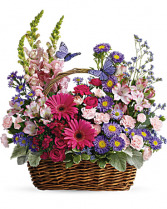 Pink roses, red tulips, yellow irises, purple hyacinth, white monte cassino asters and green button mums are arranged with oregonia and Spanish moss in a pretty tin container that is larger than the shallow plastic terra-cotta container pictured! Text or call us and we can send you a picture! If you need to order flowers after hours posted please call us! Saturday afternoon and Sundays please call first before coming to the store because we may be decorating off premise for an event or wedding! Call us Anytime!